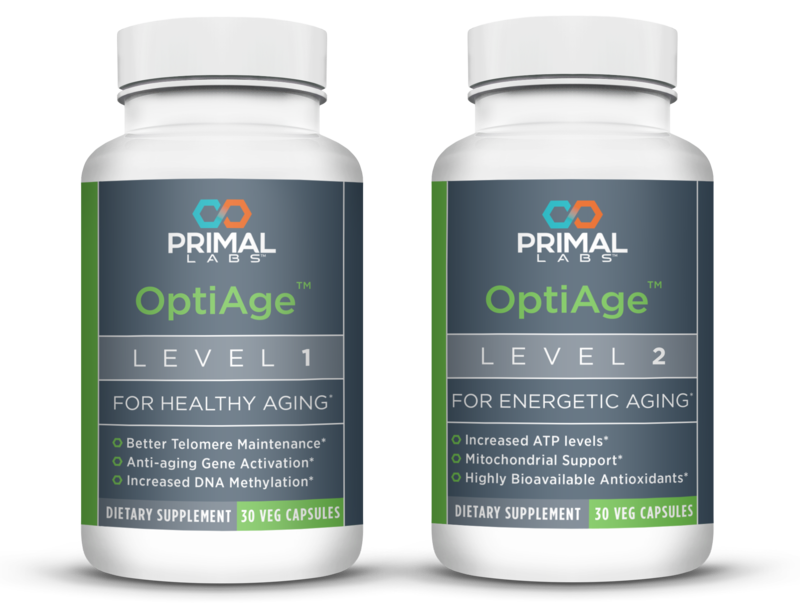 OptiAge Levels 1 and 2 provide complete anti-aging support. 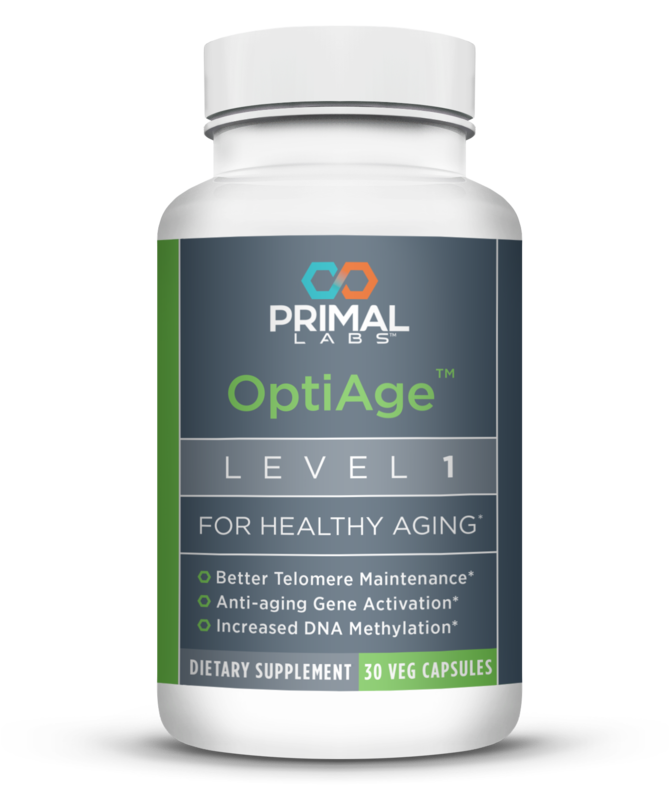 And for the most complete anti-aging support available, be sure to use OptiAge Level 1 in conjunction with OptiAge Level 2. * See below for more information. But you need more energy? Stimulants force your adrenal glands to pump out hormonal energy. But do nothing to replace what you've used. And one day you will run out. For thousands of years, Ayurvedic medicine has been using Shilajit – a rare organic substance from the Himalayas. It's rich in trace minerals, humic acid and fulvic acid. 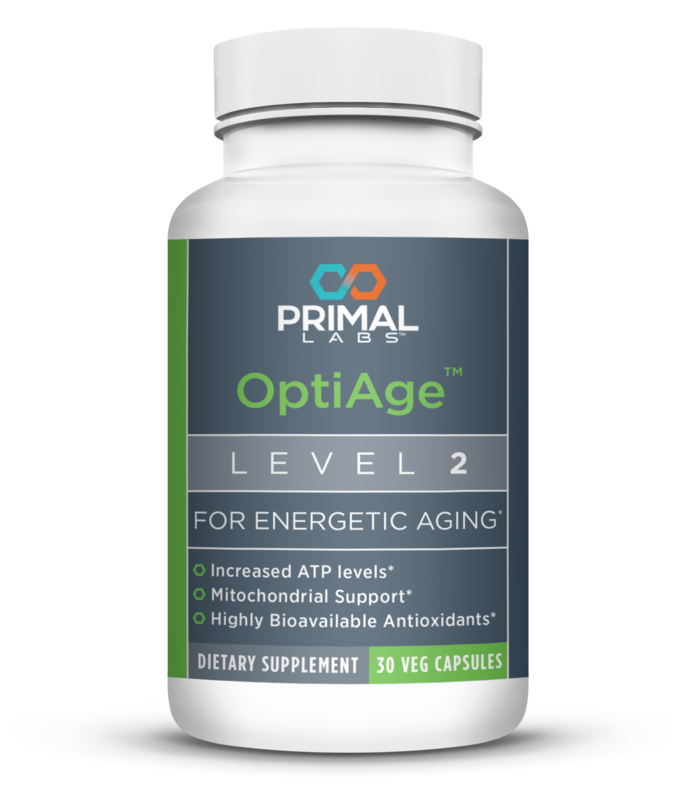 Finally, OptiAge Level 2 contains 50mg of R-Alpha-Lipoic acid. 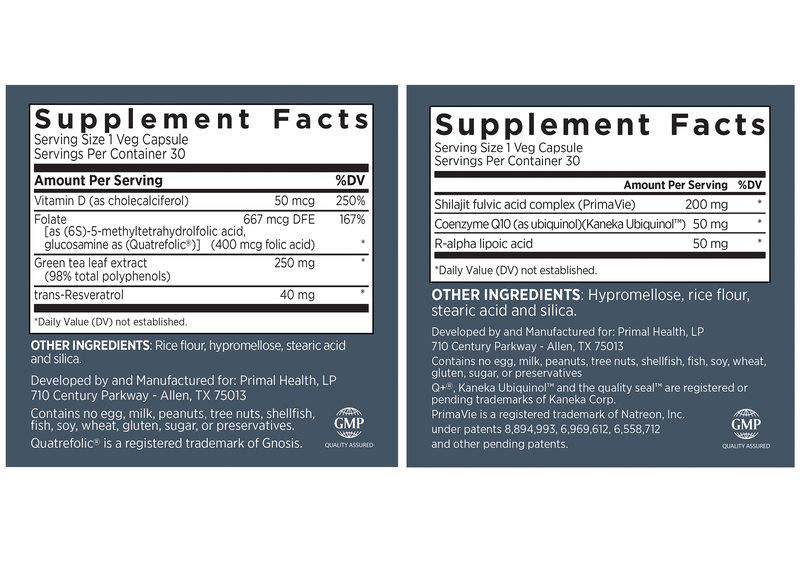 Known as the Universal Antioxidant, Alpha-Lipoic acid is effective throughout your body. And it helps recycle all other antioxidants. … why not give OptiAge Level 2 a try? If you don't agree it's worth every cent of your purchase price, we'll give you your money back – no questions asked. Abu El Maaty MA, Hanafi RS, El-Badawy S, Gad MZ. Aging Clin Exp Res. 2014 Aug;26(4):363-8. Almeida L, Vaz-da-Silva M, Falcão A, Soares E, Costa R, Loureiro AI, Fernandes-Lopes C, Rocha JF, Nunes T, Wright L, Soares-da-Silva P. Mol Nutr Food Res. 2009 May;53 Suppl 1:S7-15. Aloia JF, Li-Ng M. Epidemiol Infect. 2007 Oct;135(7):1095-6; author reply 1097-8. Anderson JL, May HT, Horne BD, Bair TL, Hall NL, Carlquist JF, Lappé DL, Muhlestein JB; Intermountain Heart Collaborative (IHC) Study Group. Am J Cardiol. 2010 Oct 1;106(7):963-8. Anton SD, Embry C, Marsiske M, Lu X, Doss H, Leeuwenburgh C, Manini TM. Exp Gerontol. 2014 Sep;57:181-7. Armas LA, Hollis BW, Heaney RP. J Clin Endocrinol Metab. 2004 Nov;89(11):5387-91. Assuncao M, Andrade JP. Front Biosci (Landmark Ed). 2015 Jan 1;20:247-62. Bass TM, Weinkove D, Houthoofd K, Gems D, Partridge L. Mech Ageing Dev. 2007 Oct;128(10):546-52. Basu A, Betts NM, Mulugeta A, Tong C, Newman E, Lyons TJ. Nutr Res. 2013 Mar;33(3):180-7. Baur JA, Pearson KJ, Price NL, Jamieson HA, Lerin C, Kalra A, Prabhu VV, Allard JS, Lopez-Lluch G, Lewis K, Pistell PJ, Poosala S, Becker KG, Boss O, Gwinn D, Wang M, Ramaswamy S, Fishbein KW, Spencer RG, Lakatta EG, Le Couteur D, Shaw RJ, Navas P, Puigserver P, Ingram DK, de Cabo R, Sinclair DA. Nature. 2006 Nov 16;444(7117):337-42. Bogdanski P, Suliburska J, Szulinska M, Stepien M, Pupek-Musialik D, Jablecka A. Nutr Res. 2012 Jun;32(6):421-7. Borras M, Panizo S, Sarró F, Valdivielso JM, Fernandez E. Clin Ther. 2012 Apr;34(4):849-56. Brasnyó P, Molnár GA, Mohás M, Markó L, Laczy B, Cseh J, Mikolás E, Szijártó IA, Mérei A, Halmai R, Mészáros LG, Sümegi B, Wittmann I. Br J Nutr. 2011 Aug;106(3):383-9. Brönstrup A, Hages M, Prinz-Langenohl R, Pietrzik K. Am J Clin Nutr. 1998 Nov;68(5):1104-10. Bryan J, Calvaresi E, Hughes D. J Nutr. 2002 Jun;132(6):1345-56. Cao Y, Jones G, Cicuttini F, Winzenberg T, Wluka A, Sharman J, Nguo K, Ding C. Trials. 2012 Aug 6;13:131. Choi SW, Yeung VT, Collins AR, Benzie IF. Mutagenesis. 2015 Jan;30(1):129-37. Crider KS, Yang TP, Berry RJ, Bailey LB. Adv Nutr. 2012 Jan;3(1):21-38. Dawson-Hughes B, Dallal GE, Krall EA, Harris S, Sokoll LJ, Falconer G. Ann Intern Med. 1991 Oct 1;115(7):505-12. Dawson-Hughes B, Harris SS, Krall EA, Dallal GE. N Engl J Med. 1997 Sep 4;337(10):670-6. Forman JP, Scott JB, Ng K, Drake BF, Suarez EG, Hayden DL, Bennett GG, Chandler PD, Hollis BW, Emmons KM, Giovannucci EL, Fuchs CS, Chan AT. Hypertension. 2013 Apr;61(4):779-85. Geusens P, Vanderschueren D, Verstraeten A, Dequeker J, Devos P, Bouillon R. Calcif Tissue Int. 1991 Sep;49(3):168-73. Ghanim H, Sia CL, Abuaysheh S, Korzeniewski K, Patnaik P, Marumganti A, Chaudhuri A, Dandona P. J Clin Endocrinol Metab. 2010 Sep;95(9):E1-8. Goh KP, Lee HY, Lau DP, Supaat W, Chan YH, Koh AF. Int J Sport Nutr Exerc Metab. 2014 Feb;24(1):2-13. Grazio S, Nagli?? ? ?B, Ani?? B, Grubiši?? F, Bobek D, Bakula M, Kavanagh HS, Kuna AT, Cvijeti?? S. Am J Med Sci. 2015 Jan;349(1):46-9. Heaney RP, Barger-Lux MJ, Dowell MS, Chen TC, Holick MF. J Clin Endocrinol Metab. 1997 Dec;82(12):4111-6. Heaney RP, Dowell MS, Hale CA, Bendich A. J Am Coll Nutr. 2003 Apr;22(2):142-6. Heaney RP, Recker RR, Grote J, Horst RL, Armas LA. J Clin Endocrinol Metab. 2011 Mar;96(3): E447-52. Howitz KT, Bitterman KJ, Cohen HY, Lamming DW, Lavu S, Wood JG, Zipkin RE, Chung P, Kisielewski A, Zhang LL, Scherer B, Sinclair DA. Nature. 2003 Sep 11;425(6954):191-6. Epub 2003 Aug 24. Itami N, Shirasuna K, Kuwayama T, Iwata H. Theriogenology. 2015 May;83(8):1360-7. Kado DM, Karlamangla AS, Huang MH, Troen A, Rowe JW, Selhub J, Seeman TE. Am J Med. 2005 Feb;118(2):161-7. Kim YI. J Nutr. 2005 Nov;135(11):2703-9. Klaunig JE, Xu Y, Han C, Kamendulis LM, Chen J, Heiser C, Gordon MS, Mohler ER 3rd. Proc Soc Exp Biol Med. 1999 Apr;220(4):249-54. Laslett LL, Quinn S, Burgess JR, Parameswaran V, Winzenberg TM, Jones G, Ding C. Ann Rheum Dis. 2014 Apr;73(4):697-703. Li-Ng M, Aloia JF, Pollack S, Cunha BA, Mikhail M, Yeh J, Berbari N. Epidemiol Infect. 2009 Oct;137(10):1396-404. Liu JJ, Prescott J, Giovannucci E, Hankinson SE, Rosner B, Han J, De Vivo I. Am J Epidemiol. 2013 Jun 15;177(12):1411-7. Logan VF, Gray AR, Peddie MC, Harper MJ, Houghton LA. Br J Nutr. 2013 Mar 28;109(6):1082-8. Magyar K, Halmosi R, Palfi A, Feher G, Czopf L, Fulop A, Battyany I, Sumegi B, Toth K, Szabados E. Clin Hemorheol Microcirc. 2012;50(3):179-87. Malas FU, Kara M, Aktekin L, Ersöz M, Ozçakar L. Clin Rheumatol. 2014 Sep;33(9):1331-4. Marcucci R, Zanazzi M, Bertoni E, Rosati A, Fedi S, Lenti M, Prisco D, Castellani S, Abbate R, Salvadori M. Transplantation. 2003 May 15;75(9):1551-5. Martins D, Wolf M, Pan D, Zadshir A, Tareen N, Thadhani R, Felsenfeld A, Levine B, Mehrotra R, Norris K. Arch Intern Med. 2007 Jun 11;167(11):1159-65. McAlindon T, LaValley M, Schneider E, Nuite M, Lee JY, Price LL, Lo G, Dawson-Hughes B. JAMA. 2013 Jan 9;309(2):155-62. Murias M, Handler N, Erker T, Pleban K, Ecker G, Saiko P, Szekeres T, Jäger W. Bioorg Med Chem. 2004 Nov 1;12(21):5571-8. Pufulete M, Al-Ghnaniem R, Khushal A, Appleby P, Harris N, Gout S, Emery PW, Sanders TA. Gut. 2005 May;54(5):648-53. Richards JB, Valdes AM, Gardner JP, Paximadas D, Kimura M, Nessa A, Lu X, Surdulescu GL, Swaminathan R, Spector TD, Aviv A. Am J Clin Nutr. 2007 Nov;86(5):1420-5. Sanghi D, Mishra A, Sharma AC, Singh A, Natu SM, Agarwal S, Srivastava RN. Clin Orthop Relat Res. 2013 Nov;471(11):3556-62. Saposnik G, Ray JG, Sheridan P, McQueen M, Lonn E; Heart Outcomes Prevention Evaluation 2 Investigators. Stroke. 2009 Apr;40(4):1365-72. Schnyder G, Roffi M, Flammer Y, Pin R, Hess OM. JAMA. 2002 Aug 28;288(8):973-9. Seijo M, Mastaglia S, Brito G, Somoza J, Oliveri B. Medicina (B Aires). 2012;72(3):195-200. Serafini M, Ghiselli A, Ferro-Luzzi A. Eur J Clin Nutr. 1996 Jan;50(1):28-32. Suliburska J, Bogdanski P, Szulinska M, Stepien M, Pupek-Musialik D, Jablecka A. Biol Trace Elem Res. 2012 Dec;149(3):315-22. Sun Q, Shi L, Rimm EB, Giovannucci EL, Hu FB, Manson JE, Rexrode KM. Am J Clin Nutr. 2011 Aug;94(2):534-42. Takada Y, Bhardwaj A, Potdar P, Aggarwal BB. Oncogene. 2004 Dec 9;23(57):9247-58. Timmers S, Konings E, Bilet L, Houtkooper RH, van de Weijer T, Goossens GH, Hoeks J, van der Krieken S, Ryu D, Kersten S, Moonen-Kornips E, Hesselink MK, Kunz I, Schrauwen-Hinderling VB, Blaak EE, Auwerx J, Schrauwen P. Cell Metab. 2011 Nov 2;14(5):612-22. Toole JF, Malinow MR, Chambless LE, Spence JD, Pettigrew LC, Howard VJ, Sides EG, Wang CH, Stampfer M. JAMA. 2004 Feb 4;291(5):565-75. Trang HM, Cole DE, Rubin LA, Pierratos A, Siu S, Vieth R. Am J Clin Nutr. 1998 Oct;68(4):854-8. Triantafyllou NI, Nikolaou C, Boufidou F, Angelopoulos E, Rentzos M, Kararizou E, Evangelopoulos ME, Vassilopoulos D. Parkinsonism Relat Disord. 2008;14(4):321-5. Urashima M, Segawa T, Okazaki M, Kurihara M, Wada Y, Ida H. Am J Clin Nutr. 2010 May;91(5):1255-60.
van der Griend R, Biesma DH, Haas FJ, Faber JA, Duran M, Meuwissen OJ, Banga JD. J Intern Med. 2000 Sep;248(3):223-9.
van Oort FV, Melse-Boonstra A, Brouwer IA, Clarke R, West CE, Katan MB, Verhoef P. Am J Clin Nutr. 2003 May;77(5):1318-23. Vermeulen EG, Stehouwer CD, Twisk JW, van den Berg M, de Jong SC, Mackaay AJ, van Campen CM, Visser FC, Jakobs CA, Bulterjis EJ, Rauwerda JA. Lancet. 2000 Feb 12;355(9203):517-22. Warner AE, Arnspiger SA. J Clin Rheumatol. 2008 Feb;14(1):12-6. Weisburger JH. Proc Soc Exp Biol Med. 1999 Apr;220(4):271-5. Witham MD, Dove FJ, Dryburgh M, Sugden JA, Morris AD, Struthers AD. Diabetologia. 2010 Oct;53(10):2112-9. Wong RH, Howe PR, Buckley JD, Coates AM, Kunz I, Berry NM. Nutr Metab Cardiovasc Dis. 2011 Nov;21(11):851-6. Wu SH, Ho SC, Zhong L. South Med J. 2010 Aug;103(8):729-37. Yajnik CS, Lubree HG, Thuse NV, Ramdas LV, Deshpande SS, Deshpande VU, Deshpande JA, Uradey BS, Ganpule AA, Naik SS, Joshi NP, Farrant H, Refsum H. Asia Pac J Clin Nutr. 2007;16(1):103-9. Yazaki Y, Chow G, Mattie M. J Altern Complement Med. 2006 Nov;12(9):881-5. Zhang FF, Driban JB, Lo GH, Price LL, Booth S, Eaton CB, Lu B, Nevitt M, Jackson B, Garganta C, Hochberg MC, Kwoh K, McAlindon TE. J Nutr. 2014 Dec;144(12):2002-8. Zhu H, Guo D, Li K, Pedersen-White J, Stallmann-Jorgensen IS, Huang Y, Parikh S, Liu K, Dong Y. Int J Obes (Lond). 2012 Jun;36(6):805-9. Bresolin N, Doriguzzi C, Ponzetto C, Angelini C, Moroni I, Castelli E, Cossutta E, Binda A, Gallanti A, Gabellini S, et al. J Neurol Sci. 1990 Dec;100(1-2):70-8. Digiesi V, Cantini F, Oradei A, Bisi G, Guarino GC, Brocchi A, Bellandi F, Mancini M, Littarru GP. Mol Aspects Med. 1994;15 Suppl:s257-63. Sobreira C, Hirano M, Shanske S, Keller RK, Haller RG, Davidson E, Santorelli FM, Miranda AF, Bonilla E, Mojon DS, Barreira AA, King MP, DiMauro S. Neurology. 1997 May;48(5):1238-43. Ylikoski T, Piirainen J, Hanninen O, Penttinen J. Mol Aspects Med. 1997;18 Suppl: S283-90. Thibault A, Samid D, Tompkins AC, Figg WD, Cooper MR, Hohl RJ, Trepel J, Liang B, Patronas N, Venzon DJ, Reed E, Myers CE. Clin Cancer Res. 1996 Mar;2(3):483-91. Breithaupt-Grögler K, Niebch G, Schneider E, Erb K, Hermann R, Blume HH, Schug BS, Belz GG. Eur J Pharm Sci. 1999 Apr;8(1):57-65. Singh RB, Niaz MA, Rastogi SS, Shukla PK, Thakur AS. J Hum Hypertens. 1999 Mar;13(3):203-8. Konrad T, Vicini P, Kusterer K, Höflich A, Assadkhani A, Böhles HJ, Sewell A, Tritschler HJ, Cobelli C, Usadel KH. Diabetes Care. 1999 Feb;22(2):280-7. Jacob S, Ruus P, Hermann R, Tritschler HJ, Maerker E, Renn W, Augustin HJ, Dietze GJ, Rett K. Free Radic Biol Med. 1999 Aug;27(3-4):309-14. Bonetti A, Solito F, Carmosino G, Bargossi AM, Fiorella PL. J Sports Med Phys Fitness. 2000 Mar;40(1):51-7. Kaikkonen J, Tuomainen TP, Nyyssonen K, Salonen JT. Free Radic Res. 2002 Apr;36(4):389-97. Hodgson JM, Watts GF, Playford DA, Burke V, Croft KD. Eur J Clin Nutr. 2002 Nov;56(11):1137-42. Hosoe K, Kitano M, Kishida H, Kubo H, Fujii K, Kitahara M. Regul Toxicol Pharmacol. 2007 Feb;47(1):19-28. Biswas TK, Pandit S, Mondal S, Biswas SK, Jana U, Ghosh T, Tripathi PC, Debnath PK, Auddy RG, Auddy B. Andrologia. 2010 Feb;42(1):48-56. Porasuphatana S, Suddee S, Nartnampong A, Konsil J, Harnwong B, Santaweesuk A. Asia Pac J Clin Nutr. 2012;21(1):12-21. Keith DJ, Butler JA, Bemer B, Dixon B, Johnson S, Garrard M, Sudakin DL, Christensen JM, Pereira C, Hagen TM. Pharmacol Res. 2012 Sep;66(3):199-206. Muraki A, Miyashita K, Mitsuishi M, Tamaki M, Tanaka K, Itoh H. J Appl Physiol (1985). 2012 Aug;113(3):479-86. Failla ML, Chitchumroonchokchai C, Aoki F. J Agric Food Chem. 2014 Jul 23;62(29):7174-82. Stohs SJ. Phytother Res. 2014 Apr;28(4):475-9. Packer L, Witt EH, Tritschler HJ. Free Radic Biol Med. 1995 Aug;19(2):227-50. Biewenga GP, Haenen GR, Bast A. Gen Pharmacol. 1997 Sep;29(3):315-31. Burke BE, Neuenschwander R, Olson RD. South Med J. 2001 Nov;94(11):1112-7. Caso G, Kelly P, McNurlan MA, Lawson WE. Am J Cardiol. 2007 May 15;99(10):1409-12. Kumar MR, Reddy AG, Anjaneyulu Y, Reddy GD. Toxicol Int. 2010 Jul;17(2):45-8. Ansar H, Mazloom Z, Kazemi F, Hejazi N. Saudi Med J. 2011 Jun;32(6):584-8. Hermann R, Mungo J, Cnota PJ, Ziegler D. Clin Pharmacol. 2014 Nov 28;6:195-204.